Welcome to the Friern Barnet & District Local History Society. We are a young society but we are active, not only in researching the past, but recording the present for future historians. Our founder, John Donovan, lived in Friern Barnet between 1966 and 1995. He became concerned that nothing was being done to record and preserve the history of the area and before long there would be nobody left who remembered it. He decided to start a local history society and in late 1999 he gathered together a few like-minded people and the Society was formed. We had our first public meeting in September 2000, at the former Friern Barnet Town Hall, and by the end of that year we had a membership of over 100. It was named “Friern Barnet and District” as a reflection of its interest in not only the area covered by the former Friern Barnet Urban District Council but also the neighbouring areas of New Southgate, North Finchley and Whetstone. Our aims are to encourage the preservation of things of local interest, to study and record local history and to arrange lectures on topics of local and general historical interest. We publish a Newsletter four times a year and we produce a number of publications on various topics. We hold ten public meetings a year and occasionally organise walks around the area. 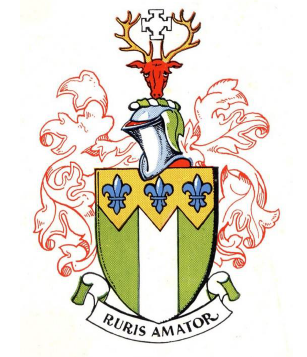 The Friern Barnet Coat of Arms. If you are interested in the history of our area, either as a current or former resident, or for study purposes, please look through our pages. We would be delighted to hear from you. You can contact us by email: friernbarnethistory@hotmail.co.uk or by telephoning 020 8368 8314. We currently have over 180 members and if you would like to join them please visit our MEMBERSHIP page to find a copy of the membership form.